A couple of weeks ago, I wrote up a little piece on the military and police use of weaponized robots, and how that's a little scary. And this thing is actually being used at this moment. Three of them. With 80 more planned. SWORDS is designed to take on "high risk combat missions," according to an Army statement. A specialist controlling the robot could send it into a potentially dangerous situation, such as a narrow street infested with snipers, seek targets and take them out before a foot patrol follows. "Anytime you utilize technology to take a U.S. service member out of harm’s way, it is worth every penny," said John Saitta, a consultant with Smart Business Advisory and Consulting and a major in the Marine Corps reserves, who has been trained as a weapons and tactic instructor. "These armed robots can be used as a force multiplier to augment an already significant force in the battle space," he added. The obvious next step is automation, as we'll eventually have more machines than people on the battle field, and simply not enough people to control them all. From that will come the rise of the machines, and then finally the end of human civilization. So what exactly is "a little scary" about using robots on the battlefield? Seems like a pretty good idea to me. 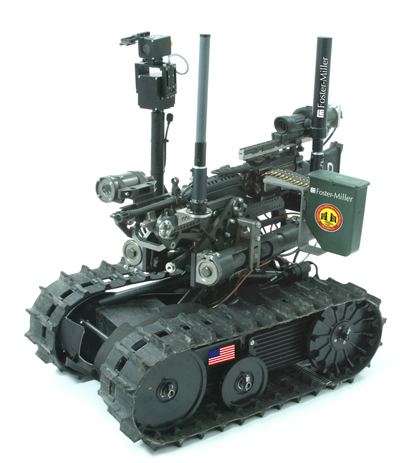 We used robots in Iraq to inspect and disarm IED threats... would you rather have a human continue carrying out this job? Even armed, I think robots have a valid place on the modern battlefield. Gone will be the days of men peeking around corners or penetrating urban objectives in the blind. Less human death is our goal, is it not? Robots as our eyes and ears (and sometimes first defense) sounds like a pretty brilliant idea to me. Actually I think it would be cool if entire wars were fought with robots so that that the loser concedes when his robots lose. Very cool. TCM - If everybody had robots, sure. But that's not the case, so I don't think that the statement" less human deaths" is accurate. I predict that it'll allow US forces to kill more people more quickly. This will result in a decrease in death of US forces, but not necessarily a decrease in death overall. Oh - and machines that disarm IED threats: fantastic. Machines with guns: horrifying. Luke - for that matter, battling it out over a game of chess would be just as good, and would be significantly less expensive. "If everybody had robots, sure. But that's not the case, so I don't think that the statement" less human deaths" is accurate. I predict that it'll allow US forces to kill more people more quickly. This will result in a decrease in death of US forces, but not necessarily a decrease in death overall." Hmmm... not sure if I agree completely. While I definitely agree those militaries which utilize robots will most likely incur less human death, I think the general statement "less human deaths" remains accurate. How does using robots inflict more death on the enemy than ground troops? I don't see the connection. The Marines are confronted by five members of Al-Qaeda and eliminate all. The terrorists, however, were able to squeeze off a few rounds -- killing one Marine and wounding another. Result: 5 dead terrorists + 1 dead Marine = 6 human deaths. The robot is confronted by five members of Al-Qaeda and eliminates all. As the last terrorist sunk to the ground, he manages to squeeze off a few rounds into the robot -- rendering the robot combat ineffective. Result: 5 dead terrorists + 0 dead Marines + 1 combat ineffective robot = 5 human deaths. Now, I'm terrible at math, but I'm pretty sure 5 is less than 6. And while the American troops who utilized robots did incur less death than their terrorist counterparts, overall there was "less human death." Of course a hypothetical is just that -- hypothetical. BTW, I guess you can take a little credit as I've started a new hobby blog - inspired by your separate hobby blogs. The non-political can be so refreshing.